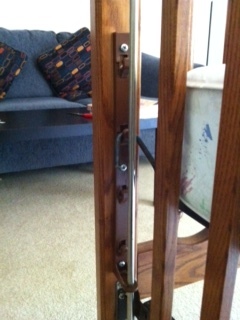 I have looked all over for the ear type brackets for a 1997 Simmons baby crib that is needed to hold the metal hooks. Unfortunately a few ears of the ones that we have have been broken so we can't put the crib mattress on the bed. Could everyone please check in your parts inventory and let us know whether you have that part lying around? I have attached a picture to show everyone the bracket for reference. Go Here to See What's Available in the way of hardware, springs, bolts or screws to help you assemble your Simmons crib. If anyone has any suggestions for a resource that carries Ear Type Brackets for a 1997 Simmons Baby Crib can you please contact me using the space below (and PLEASE include your contact information in case I need to get in touch with you!). Unique Baby Gear Ideas encourages our visitors to share their resources for crib replacement parts such as this ear type bracket that Ankur wants, alert us to crib recalls and to consider writing reviews of their cribs to make our little community of expectant parents aware of any problems that are associated with different models and brands. I have been looking for 4 crib spring hooks. Sometimes they are called tunnel hooks. They attach to each corner of the springs to adjust height of mattress. I've looked everywhere. Was wondering if anyone has any of the crib brackets pictured above. If interested in getting rid of one that you might have lying around, please email me at laydbug1304@yahoo dot com. Not sure when these requests were printed, but as of now, I have two sets of these crib brackets left over from the assembly of a crib we had for our granddaughters. If anyone wants them, I will send them to you for the price of postage. Has anyone found these brackets? I just went to use my old crib and have discovered also that I have parts missing. I am missing the very bottom of these brackets. Can anyone help? I am in need of the same brackets for my children's bed, bought in 1983. The bed is in perfect condition except for the plastic brackets that broke when I tried to reassemble the bed for a grand nephew. There are safety recalls on some of the Simmons beds.....but this bed was used by many children other than my two and is safe ..This in a very special piece of furniture to our family....Surely there are parts somewhere! I'm sorry to say but I was unable to find these brackets (as they have been discontinued a long time ago) and had to buy a new crib for my baby. Thanks! I am need of the same thing. My 1982 crib came back 20 years ago missing 2 of these ear type brackets and I just realized it today (2/12/13) as I am cleaning it for a grandbaby. Did you ever locate these? I have seen on another website that they are no longer made and we have to convert to a bolt-in type support which do not work with the hangers attached to the spring unit. Here's hoping you were successful.